. إن شقق أوكس فيستيفال تاورز حريص على توفير الراحة للنزلاء، فلا يوفر الموظفون جهداً في تقديم أفضل الخدمات وضمان حسن الاستقبال. إن مكتب الاستقبال على مدار الساعة, تسجيل وصول/خروج سريع, تخزين الأمتعة, صف السيارات, غرفة عائلية هي جزء فقط من الخدمات التي تميز شقق أوكس فيستيفال تاورز عن باقي الفنادق في المدينة. تنعكس أجواء شقق أوكس فيستيفال تاورز في غرف الضيوف.تلفزيون بشاشة مسطحة, اتصال لاسلكي بالإنترنت, اتصال لاسلكي بشبكة الإنترنت (مجاني), غرف لغير المدخنين, مكيف هواء هي بعض الميزات الموجود في العديد من الغرف. يقدم الفندق خدمات رائعة كمثل مركز للياقة البدنية, ساونا, حمام سباحة خارجي, سبا لمساعدتك على الاسترخاء بعد نهار طويل من النشاط والتجوال في المدينة. يشكل شقق أوكس فيستيفال تاورز بخدماته الراقية وموقعه الممتاز، قاعدة مثالية للاستمتاع بإقامتك في بريسبان. Have stayed at other hotels in Brisbane CBD but will only stay here now. This is my 3rd stay , great location, friendly staff, nice pools, clean apartments and good value for money no complaints again. Simple and basic room. Air conditioning was not the best. Biggest downfall is limited free wifi for 24 hour period and chargeable every 30 minutes after the initial hour. Unsuitable for business travellers. For some reason you are given a daily "free internet" allowance..after which, any use is charged. Not really suitable for a business traveller who is planning to do any sort of cloud based work from this hotel. A lot of other cheap alternative in the are with unlimited wifi allowance (albeit at a lower up/down speed). I've stayed here for weekends trip with my family. Overall, the location was great as we could walk to main city centre as well as riverside walk. But keep in mind when you search for the location in google map as there is another accommodation name with Oaks, so better double before heading to your destination. Only issue I had was the all night roadworks in the Brisbane CBD, which no one tells you about until you get there, personally I would look for something that is not in the middle of the city until works are completed, as its just impossible to sleep!! I stayed higher floor room river viewing side. Very impressive night view. It also has a wide full glass balcony and dining room with comfirtable couch. all bedroom is nice and comfy. It located perfectly in the city central. I'll wait for the next deal for stay there. My second time staying here and it was great again. This hotel is close to everything, food places at your doorstep. The apartment is comfortable and spacious. The only problem being the water pressure caused my bathroom to flood slightly so just make sure you put it half way because I got a fright. Other than that fantastic, quick service at the front desk too! Great location walking distance to everything, great cafes, restaurants nearby. Staff were very accommodating moved our room for a better view and early checked us in which was great. room was well equipped and comfy bed.. would definitely stay again. Oaks Festival is conveniently located in the Brisbane Central, near to the shopping area. 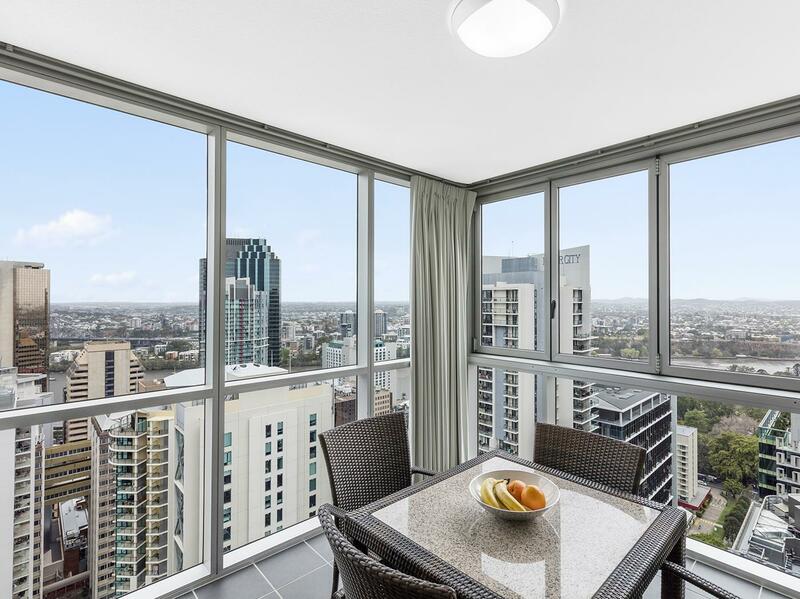 It is approximately 15 minutes walk away from the Brisbane Central train station. Very accessible. The apartment is big and spaceous. Really good for a group of friends or family on vacation. The kitchen is good, with dishwasher machine and utensils and plates provided. Only minus point would be that there is no WI-FI in the apartment. Was a great room with lovely view. Very large living area which was too bad that I was in and out and didn't have time to enjoy it. Location was great for my meeting I had. Check in at 14:00 and check out at 10:00 was a disapointment. The front door to the place locks at 6pm and you need to buzz the front desk for them to let you in. And to get out you need to walk over and buzz yourself out. Understand security but starting at 6pm is a little too much. Location is very good, just next to Queen St Mall. My partner chose this property and after our stay it will be the last time he chooses! We arrived in the evening, finding the parking to the property was a nightmare in the dark and rain there was no clear signage resulting in a quick drop off, run in, ask for directions while my partner drives blocks. Staff were quiet spoken and non informative and appeared disinterested for a Friday night. The apartment appeared clean, until we settled in. No pride is put into the cleaning of theses apartments at all, not even chairs can be tucked in or an outdoor table wiped down or the removal of rubbish on the balcony including the garden of cigarette butts. No dusting or moving of furniture or décor have been cleaned or dusted and this was very evident with the coffee table and TV unit. Suggest room checks post cleans including balconies, finding used condoms and hand towels is not appropriate finds by children. Location is excellent but we felt like we were in a goldfish bowl. Perhaps for those apartments that have all and sundry looking in to have a roller blind that is transparent for sunlight. We were looked on from all sides. Also, the smell of the refuse area was a bit overpowering. Bed was comfy. Staff were very helpful. Location is right in the centre of the city, and for what I paid for it is excellent value for money. Only complaint I have will be the restricted access to free wifi. It's only 30mins free wifi per day. For this day and age, I think free wifi is very important to all guest, wether it's leisure or business travelers. Had a hard time trying to locate the hotel carpark as there isn't any road sign indication. We stayed in the 2 bedroom apartment. Room size is rather small as compare to other areas which I've booked. Probably cause this is at the city area. Overall room is nice and cozy. Walking distance to Treasury casino and Queen Street shopping. Oaks is in the PERFECT position for shopping & restaurants in the CBD area. The reception team were so friendly & welcoming, they are a true asset to the hotel. We stayed in a 2 bedroom apartment which was a decent size, very clean with a great view of the city skyline. Would be happy to return. Great relaxed stay for 25th wedding anniversary, walking distance to riverstage where we saw a concert. Loved it and would stay again next time we are in Brisbane. Great restuarants and coffee close by, and loved having a kitchen so we could also prepare our own meal.